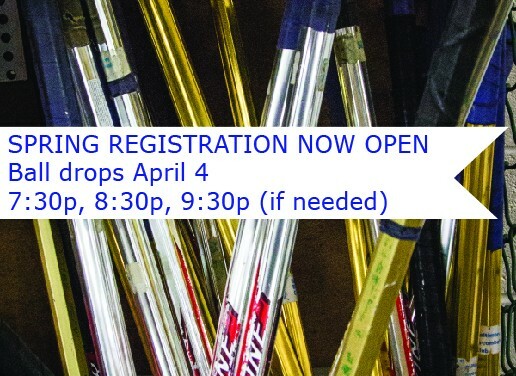 Updated Tuesday March 12, 2019 by Baltimore Broomball Club. SPRING WILL HAVE SPRUNG...AND WE WILL STILL BE PLAYING BROOMBALL! If you are interested in being Captain/Assistant for any session please email beth@baltimorebroomball.com. Teams will be selected by draft. Individuals may sign-up with a single "buddy" that s/he wants to be drafted with. Players are only guaranteed one (1) buddy. Please confirm that the buddy you are listing is reciprocating by listing you during his/her registration. Sell out will be at 4 teams of 13. Two additional teams will be added with the max number of players also being 13 if registration numbers warrant it. Slots are taken up on a first-come, first-served basis. Registration will close as soon as the 52nd or 78th spot is taken. Your spot is not confirmed until you make payment. Payment can be made online as part of the registration process, via PayPal to info@baltimorebroomball.com or via check made out to Baltimore Broomball. As always, there are helmets and sticks available for club members use. Players must supply their own knee pads, elbow pads and gloves. Shin guards are highly recommended. If this is your first session with the BBC, you may use club shoes. You are required to purchase your own shoes if/when you start your second session. "(Read in weak old lady voice) Help I want to register but the link’s not up! :)"
"^ he meant his normal voice"
"Ahhhh! It's been a year since my feet have run on ice and I want to register! "